When I first put my hand on the underside of my Titanium G4 PowerBook I became concerned that the unit could get overheated to the point where things might suffer damage. That is the reason I leaped for my credit card as soon as I heard about the iBreeze from MacMice. This device consist of an acrylic plastic sheet cleverly shaped to allow air to flow to a pair of small muffin fans that direct their air stream onto the back side of the PowerBook or iBook computer situated on top of the iBreeze. 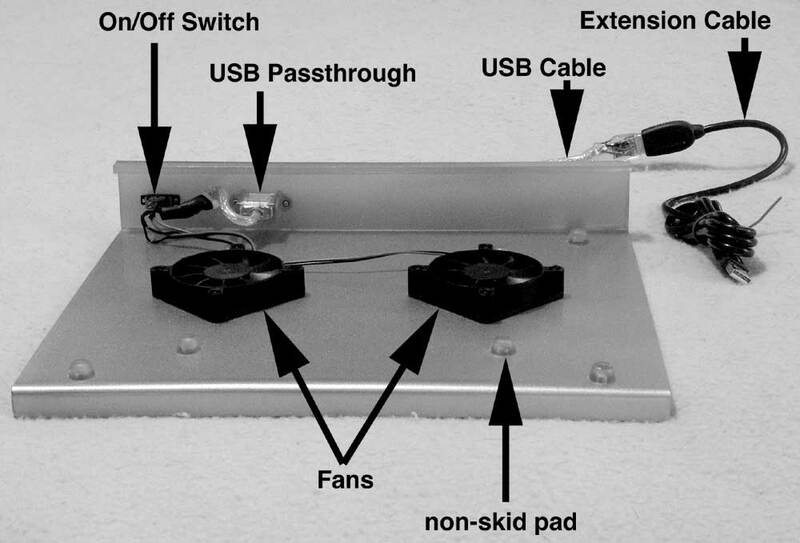 Figure 1 shows my iBreeze placed upside down so as to reveal the fans and the various other elements. 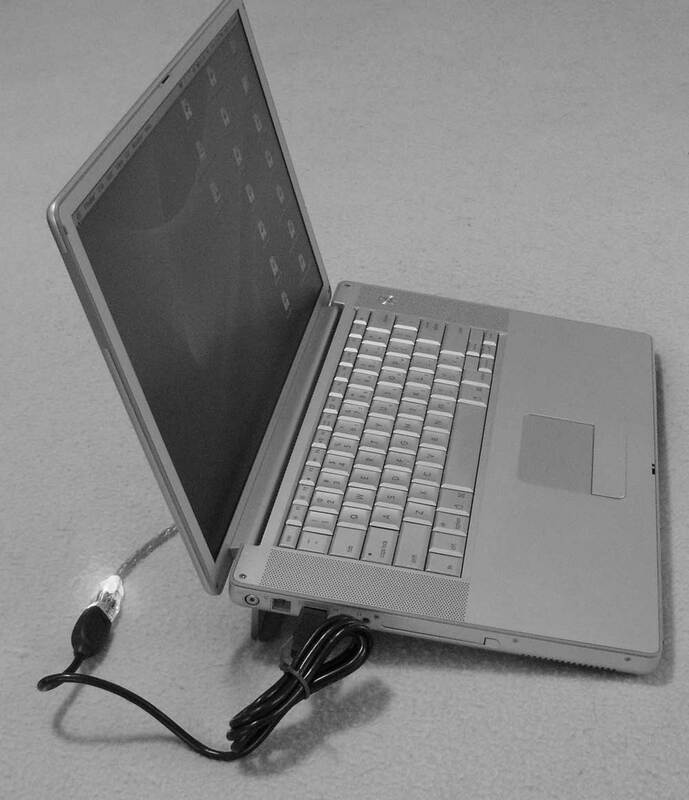 The unit draws its power from the USB cable attached to a USB port on the laptop computer as shown in Figure 2. The extension cable, which must be supplied by the user if needed, is for those cases where the USB supplied by MacMice is not long enough to reach an open port, as is the case in Figure 2. Figure 2 also shows that the transparent USB connector has an LED in it that indicates when the USB bus is supplying power. It is not easy to tell when the fans are in action because they are so quiet. The slight breeze wafting out from the underside of the laptop is the major clue. The iBreeze does its job of cooling the laptop case quite well. It is hard to say what effect this has on the guts of the computer. One can only hope that cooling the case allows the internal heat to dissipate more rapidly. I don't use the iBreeze when my sessions are short, as when I am traveling or doing incidental work away from my desk. I do use it if I am running demonstrations or putting on a show. The iBreeze is designed for use on a flat, solid surface. MacMice claims that the tilt provided by the lip on the rear of the device improves the ergonomics of using a laptop on a desk or table. The quoted price for the most recent model of the iBreeze is $29.99. This model differs from the shown in this article by being made of clear acrylic plastic throughout, which probably makes it a bit more stylish. This may also simplify the manufacturing process. On May 17th the company's web site stated that the device was temporarily out of stock. I find the iBreeze to be a nicer solution to the overheating problem than some of the passive convection devices that appeared before USB became universal. I am happy with the way my unit works and I recommend it to anyone who needs to operate a laptop computer that is sitting in one place for extended periods of time. A quick Google on "powerbook cooling" or "notebook cooler" reveals a number of competing products. I have not tested any of these and I found the iBreeze more or less by accident while seeking something else. If you have a product that you think deserves consideration by all means post a review on the Pi's TCS message board service. MacMice also has a number of other products that fill some niche needs. A trip to their products page is worthwhile.